All data entered or scanned into the field is presented on a single line. When a return line is input (e. g. the result of a ‘Return’ key), the app will auto-advance to the next available field or, if the last field, will auto-submit the scan record with all collected data. This is particularly valuable for those not only scanning barcodes for the primary scan record but also for secondary scans captured sequentially after the first scan (see Auto-Next Field here). Data entered or scanned into the field is presented on multiple lines if the data includes a return line. For example, some IDs have embedded data including return lines so information such as Name, Company, etc. will show up formatted on separate lines. An additional use of the multi-line option is to allow the app user to view the data input to the field before auto-advancing. So, for example, if multi-line is used for the last field before the app user submits a record, the app will not auto-submit the record. Instead, the app user can review the data they collected and then submit the record when ready. Select this if you exclusively capture numeric data. This is particularly useful for manual entry because the keyboard is numeric-only and hence it’s easier to input data. All Short Answer fields accept data from scanned barcodes. Select this option if you want a barcode icon shown next to the field’s header. The intention is to reinforce top the app user that you want them to scan a barcode for that field. They can also manually input data in the field if they can’t scan. 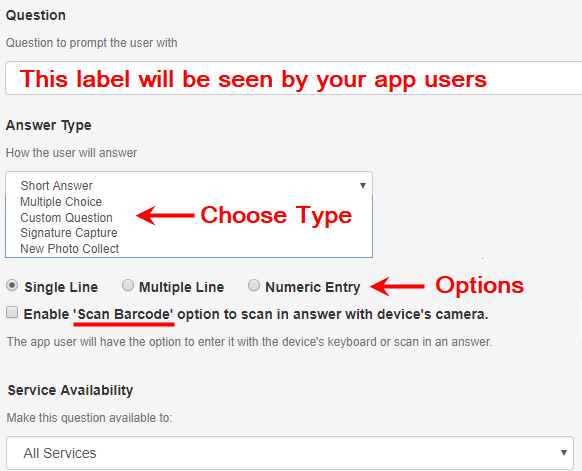 Select this option if you want the app user to capture an image as part of a formal scan record. The photo can be saved to your Dropbox account or uploaded to your server via FTP. For details on photo collect, please look here. The app user can select only one answer from the choices presented. This option is best when there’s a limited number of answer choices. The app user can select only one answer from the choices presented. This option is best when there’s a large number of answer choices. Except with Shared Answers, the first option is collected by default. So, for example, if the first answer is ‘1’ then ‘1’ will be submitted with every scan. The copy/paste option is limited to 200 answers. The app user can select more than one answer from the choices presented. This option is best when there’s a limited number of answer choices. Each captured signature becomes part of the formal scan record. This is where you can collect data using your own custom questions. You can choose whether or not you want the answers to be included in the formal codeREADr scan record. You can write scripts for online or offline use, including rules for the answer. For details on custom questions, please look here.